Popsicles? I don’t eat ’em myself. Could go for a cup of hot coffee, though. Last week the Girl and I were running some errands and, while driving about 4 miles from one store to another, we saw 5 people dressed all in black, with long sleeves and long pants. It was about 105 degrees. Today I saw a dude in a black hoodie and he was wearing the hood part. Walking down the road. In 105 degrees. I like the heat and all, but, damn. People are crazy. It’s sick hot here. Most people wear tank tops and shorts, and plenty of people carry umbrellas or parasols. It’s not at all weird to see some big tough guy carrying a pink parasol. The sun is that brutal. And then there are the people dressed like they’re going to a funeral in North Dakota, not even carrying a bottle of water. Don’t even get me started on the people out exercising at lunchtime. Here’s to you, people dressed for the winter while walking around one of the hottest parts of the country during what will most likely be remembered as the hottest summer on record (until next summer, probably). Fortunately, ice cream and quiescently frozen treats are easy to come by around here. 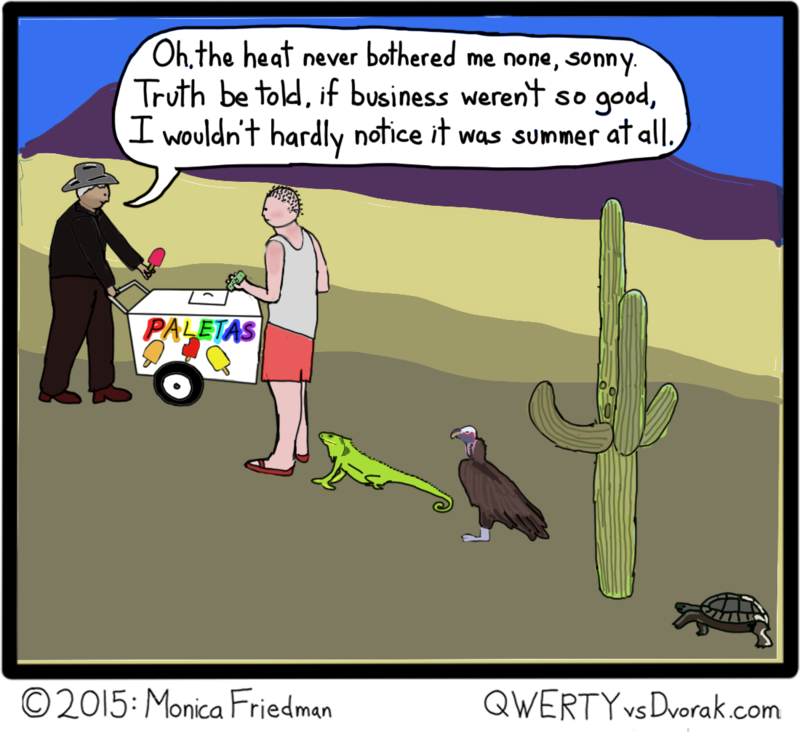 This entry was posted in webcomic and tagged animals, desert, heat, hot, iguana, paletas, tortoise, vulture, webcomic on August 20, 2015 by littledragonblue.